Superstar sisters Delia Ephron and the late, great Nora wrote some of the most popular romantic comedies in history, including Sleepless in Seattle and When Harry Met Sally. They’re also the dynamic duo behind the hilarious and poignant collection of stories Love, Loss and What I Wore. Based on the best-selling book by Ilene Beckerman, this show features women telling intimate stories inspired by the articles of clothing they were wearing at the time. 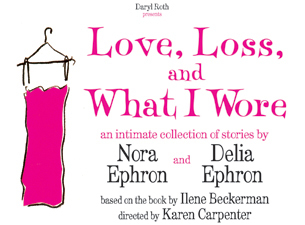 As adapted by the Ephron sisters, masters of depicting the female psyche, Love, Loss and What I Wore casts a funny, surprising and touching light on moments that every woman will relate to. Don’t miss the show that Vanity Fair called “witty and wise!” when it comes to the Contemporary Theatre of Dallas. Don’t miss this show – Totally relate able by any woman and most men! Clothing can evoke memories – make us happy and all measure of miserable – is seasonal, regional and changes with the decades and pounds gained and lost. And clothing – whether we purchase or we create also says a lot about us. Our personality, our mood, our level of self esteem. Recently Sheryl was reading “Change Your Clothes, Change your Life, Because You Can’t Go Naked” This book by fashion stylist George Brescia highlights how are clothing “labels and defines” our selves to both our internal psyche and how we are judged by everyone we meet using the criteria of our clothing. As clothing and accessory makers, we have even more ability to create fabulous memories, and to elevate our self esteem with our creations. What is your favorite clothing memory or how an outfit changed your day or your entire life?